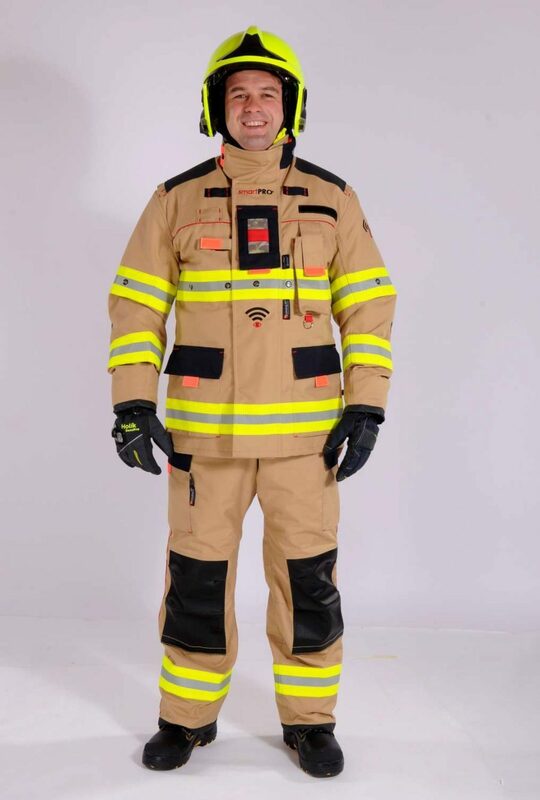 GoodPRO FR4 FireBull in smart version is a certified three-layer protective suit for firefighters, designed especially for extinguishing of interior fires under extreme conditions as for temperature, fumes and/or orientation in space. It is equipped with a sophisticated electronic system smart consisting of sensors, active light system, alarm and SCU (Suit Control Unit). 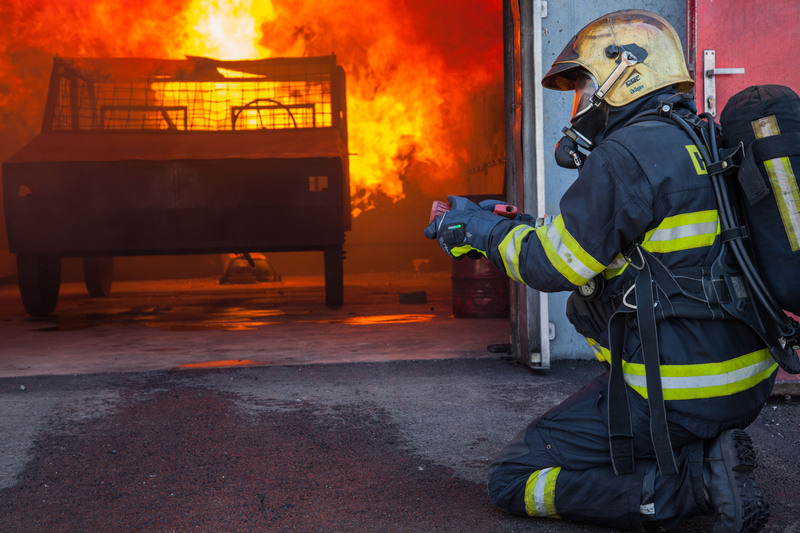 The system can continually monitor and evaluate safety of the environment in which a firefighter is operating (temperature inside and outside the garment, moisture, humidity, toxic and explosive gases). It also provides information about the position of the body, physiological functions as well as the location on the map. In a case that dangerous and/or critical values are exceeded, smart system automatically activates both acoustic and visual alarm which alerts the firefighter as well as the person in command. The crew commander can see yellow, or actually red signal light on his CCU (Commander Control Unit). At the same time, he can read actual measured values. Furthermore, the crew commander can also check the position of the body (whether a firefighter is standing, lying, running, hanging or falling), physiological functions – heart rate (a firefighter has to be equipped with HR monitor strap with Bluetooth) and also his location on the map both outdoor and indoor (a firefighter has to be equipped with DUNE localization system which employs 3D inertial sensors and can be easily placed on footwear). It enables an easy detection as well as a very effective navigation. To improve visibility of a firefighter, the suit is equipped with 12 active led lights which are fixed on the main reflective tape. The system can work in 4 different light modes. The light sensors enable the active light system to react independently to the light conditions in the environment in which the firefighter is operating. SmartPRO suit can also be equipped with special Holík smart gloves. The right glove employs two temperature sensors which can measure not only the temperature on the glove surface, but also the temperature of distant objects. The firefighter can check the measured values using a simple traffic light method (green-amber-red) directly on the glove. The crew commander can see the exact measured values displayed on his CCU. GoodPRO suit equipped with cutting edge smart technology raises both protection and safety of firefighters to a new, much higher level. Furthermore, it enables the crew commander directly access to a number of key online information which can significantly contribute to a safe and more efficient course of operation. All required measured data are available online to higher officers. Furthermore, all data received from the SCU can be downloaded and logged for a later analysis, operation and training assessment or for possible investigation of the cause of an accident. All values of dangerous or critical limits set by the manufacturer can be modified by the manufacturer on request to meet the individual needs of every user. Smart electronic system can be also implemented to any kind of a three layer suit made under the brand GoodPRO. The customer can choose from a wide range of possibilities as for design, material and cut.